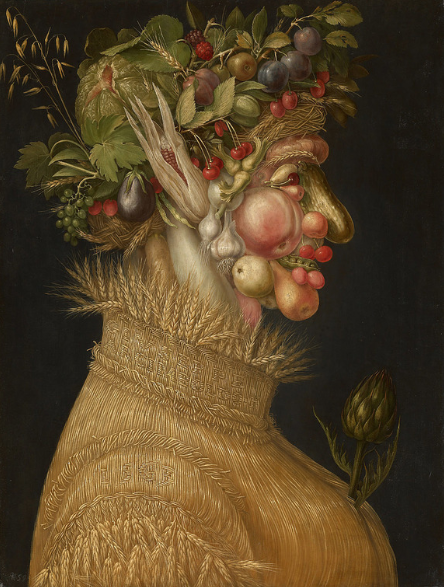 Arcimboldo Summer. 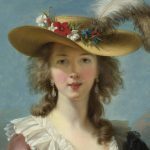 How this work arrived today at the Kunsthistorisches Museum in Vienna (the city’s art history museum) has not yet been discovered. What is sure is that this is not the only work of the Milanese artist kept in the museum. In fact, there are here also: Winter, Water and Fire. The artwork was born, therefore, from a series on the Four Seasons. The painting represents this warm period of the year with irony and shrewd insight. It succeeds through the representation of the fruit and vegetables that characterize it. But not as a still life but as a portrait. Nature on a human scale, made of straw clothes and artichokes, but also aubergines, peaches, pears, cherries and cucumbers and there are garlic, plums, blackberries and grapes. Laughing and serene. This season appears rich and fruitful, joyful and full of life. Contrary to what one might think, the picture is not the result of the author’s simple irony. But, it rather wants to be an exercise in taste. Ready to amaze through shapes and colors. Moreover, Arcimboldo, the son himself of a painter, was much appreciated and loved at the court of Prague where he had arrived in 1562 as a guest of the emperor Ferdinando I. And where for years he will also be following Massimiliano II and Rodolfo II, dictating the taste and fashion of Czech nobility. But his work will not have followed and the painter will die in 1592 in his hometown: Milan. His work will be appreciated only thanks to an awakening of interest in the early nineteenth century. But above all thanks to the Surrealist movement in the twentieth century. And Arcimboldo will manage to become the artist of the faces we all know today.